Louvre Abu Dhabi was inaugurated last week and hailed by the French president, Emmanuel Macron, as an embodiment of beauty, reason and fraternity against "the discourses of hatred". VIPs, dealers who had sold to the museum, journalists and other guests were invited from all over the world to celebrate. In a gesture of inclusiveness that is rare in the region, the workers who had built the Jean Nouvel-designed museum on Saadiyat Island were given their own party. Louvre Abu Dhabi's director, Manuel Rabaté, was present, and he later tweeted an acknowledgement of their role in its creation. Yet questions remain over the welfare of these and other construction workers, mostly migrants from the Indian subcontinent, on the island. The decade-long museum project—established in 2007 by a 30-year intergovernmental contract between France and the United Arab Emirates (UAE)—has been repeatedly criticised by human rights groups and activists who say that there have been persistent labour abuses on the site. 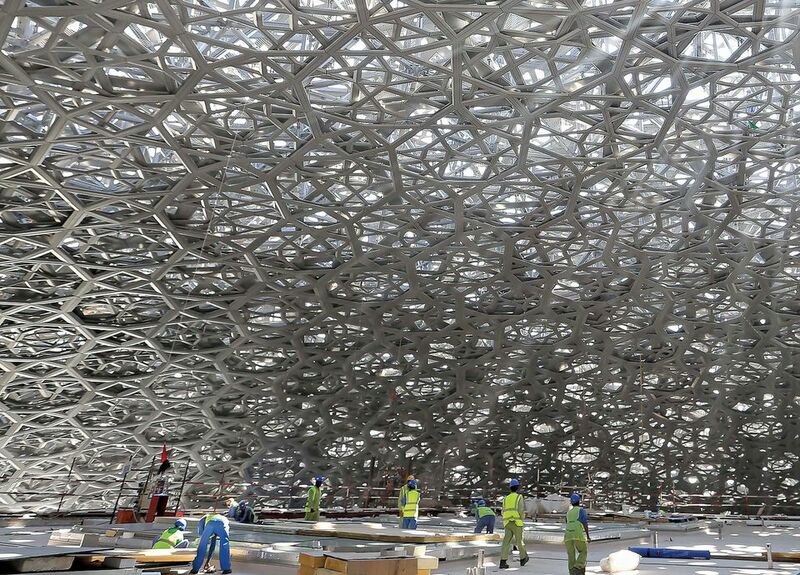 Such is the sensitivity of the issue that two journalists reporting on Louvre Abu Dhabi’s opening were detained and interrogated by UAE authorities for more than 50 hours after they filmed Pakistani workers at an open-air market. Responding to Nouvel's comments to the Guardian newspaper in September that accusations of exploitation were an "old question", the Gulf Labor coalition of artists and activists has renewed its "boycott of cultural institutions on Saadiyat Island", including the still-unbuilt Guggenheim Abu Dhabi and Zayed National Museum. "Imagining that one can cleanly compartmentalise the world of high culture from the conditions in which its institutions are realised, is the real 'old question'," the group says in a statement. The construction of the island's museums is overseen by the Emirati government-owned Tourism, Development and Investment Company (TDIC). The developer says that "protecting workers' welfare and rights is and has always been a critical priority", pointing to its "best-in-class" housing facility, Saadiyat Accommodation Village, and Employment Practices Policy "based on international best practice"—both of which were established in 2009. The company appointed PricewaterhouseCoopers (PwC) to monitor the enforcement of the policy in 2011. The firm has since issued four annual reports based on thousands of interviews with employees of the many contractors and subcontractors building Louvre Abu Dhabi and other Saadiyat sites. The reports "independently validate what human rights organisations have been saying for many years", says Sarah Leah Whitson, the executive director of the Middle East and North Africa division of Human Rights Watch (HRW). They document TDIC's practical efforts to address abusive labour practices that are endemic in the Gulf, including employers retaining workers' passports and delaying or withholding wages and employees having to pay their own recruitment and relocation fees. The developer also created a permanently manned confidential hotline for workers to report problems. The next and final PwC report will be released in early December to cover 2016 and 2017, TDIC says. The firm's 2015 survey, published in January 2016, noted improvements such as tougher rules on reimbursing recruitment and relocation fees, while drawing attention to the developer's lack of internal compliance staff and inconsistent or insufficient penalties for transgressions. PwC also recommends a "broader 'lessons learned' exercise within TDIC… to ensure changes and improvements are made prior to awarding future projects". HRW's own 2006 report on the exploitation of migrant construction workers in the UAE prompted a series of government reforms. Yet despite legislative progress, Whitson says there remains an "inadequate enforcement of rules" in a country where trade unions and strikes are criminalised and there is still no minimum wage. "You have the bizarre outcome of one of the richest countries in the world paying workers $200 a month." The opening of Louvre Abu Dhabi should not exempt the museum from further commitments to the rights of migrant workers, Whitson says. "We are still demanding that the [museum] ensure that permanent workers are given the same protections that we wanted construction workers to have." Compared to the Solomon R. Guggenheim Foundation and New York University, which opened a campus on Saadiyat Island in 2014, "the Louvre was the least responsive to the issues that we were raising", she adds. Agence France-Muséums—the French body that advises on the collections and museography of Louvre Abu Dhabi—says it has "maintained a permanent, demanding and constructive dialogue" with TDIC over workers' welfare. A spokeswoman for the Musée du Louvre in Paris says: "As a universal museum born in the Age of Enlightenment, the Louvre upholds fundamental principles of respect for human rights."